I’ve been thinking about the statues from the Temple of Menerva (also spelled Menrva) at the ancient Etruscan city of Veii this week. 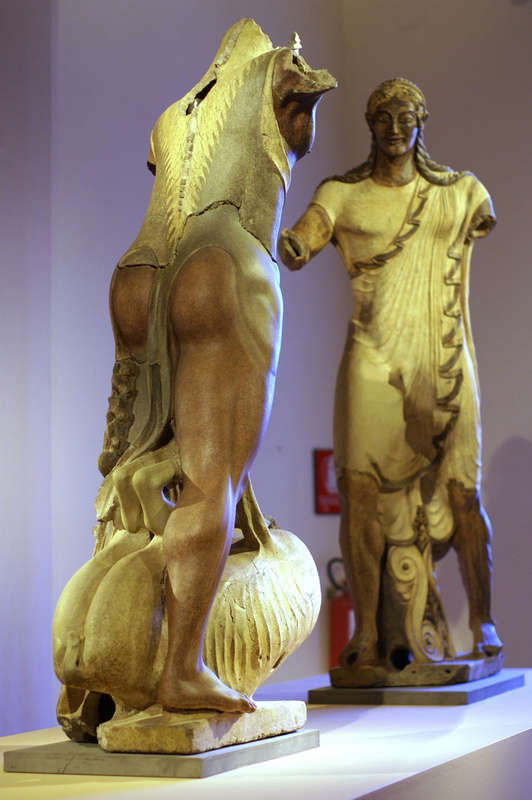 Tonight I found a cool image that shows the back of the “Apollo” statue. 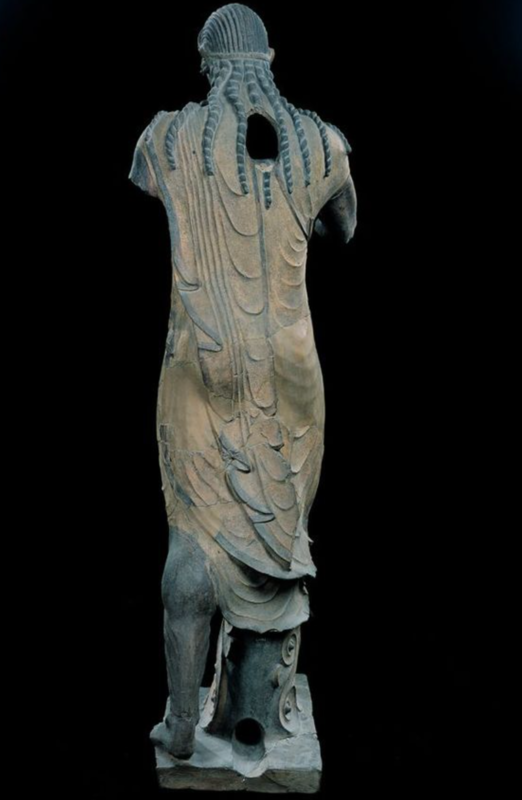 This image shows two intentional holes that created so that the terracotta would be properly ventilated during the firing process.1 One hole appears just about where the shoulder blades should be, and another is seen at the base of the decorative support between Apollo’s legs. 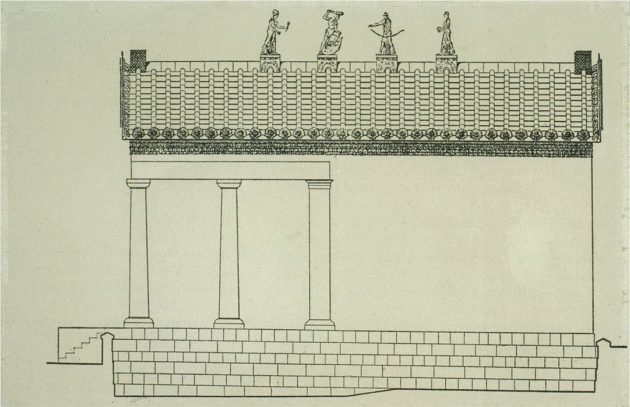 The Apollo sculpture comes from a group of four figures that would have decorated the ridgepole of the Temple of Minerva at Veii (although many other figures would have also been included along the roof of the temple, as shown in a reconstruction model). This group of figures would have referenced the third labor of Hercules, in which he is sent to capture the sacred deer with the golden horns: the Golden Hind. This deer is sacred to Diana (Apollo’s sister), and Apollo is struggling with Hercules over the deer. For more of the story, see the Smarthistory video and article on the topic. The figure of Diana has been ruined and lost over time, and today only the head of Mercury and a little bit of the body remain. However, a good portion of the Hercules figure exists today, although it is not in as good of condition as the Apollo.2 A back view of the Hercules sculpture reveals that it has similar vent holes (between the shoulders and at the bottom of the sculpture). I assume that the holes in the deer’s body are were created for ventilation purposes. Despite that terracotta doesn’t preserve extremely well, I’m glad that we have enough authentic Etruscan terracotta pieces to enjoy today (complete with authentic ventilation holes) to help us know more about the Etruscan people. Although a venting hole may seem like an insignificant technical detail, it actually can help us identify authentic works of art. 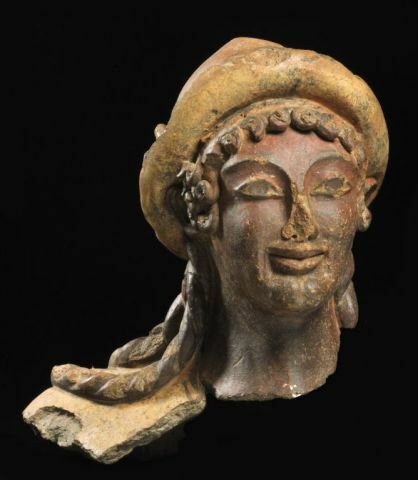 For example, the Etruscans’ use of ventilation holes helped to identify later forgeries that were created in the Etruscan style. In the early part of the 20th century, three such forgeries were created by Alfredo Fioravanti and Riccardo Riccardi (with the exception of the Colossal Warrior, which was made with the help of some of Riccardo’s family members after Riccardo’s death). These forgeries were of terracotta warriors; they were acquired by the Metropolitan Museum of Art and displayed together for the first time in 1933. 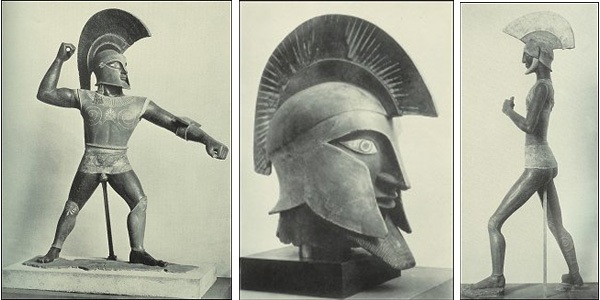 The Colossal or Heroic warrior (left), Colossal Head (center) and “Old” Warrior (right), c. 1915. The Colossal warrior is approximately 8 feet tall (about 243 cm), The Colossal Head is 4.5 feet (137 cm), the “Old warrior is 6.6 feet (202 cm). But in 1961, the Met had to admit that they had purchased works of art that were fakes. One of the tell-tale signs that these warriors were not Etruscan has to do with the vents: each warrior only had one vent, unlike the Etruscan works of art that are fired as a single unit with multiple vents (as shown in the Apollo and Hercules sculptures).3 This indicates that the large forgeries were fired separately and then reassembled. 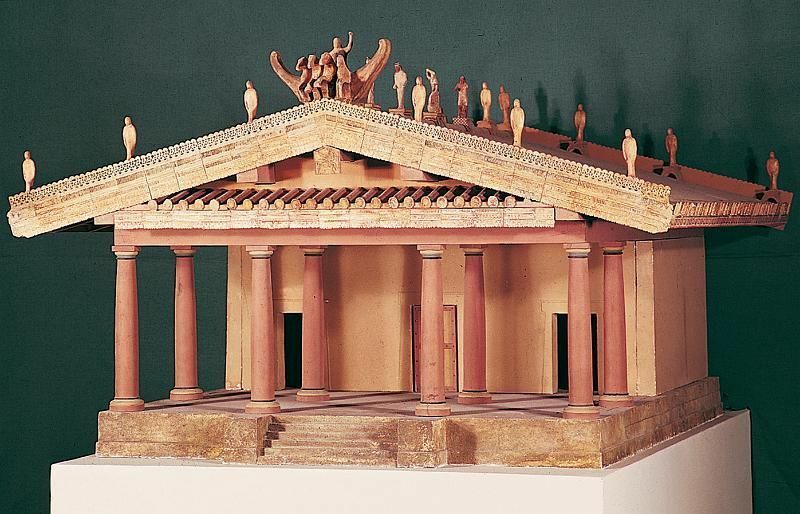 The modern day forgers did not have a kiln large enough to fire these large-scale objects! If they had taken the time to build such a kiln (and in turn create the proper number of ventilation holes), I wonder if it would have taken experts longer to determine that these sculptures were forgeries! 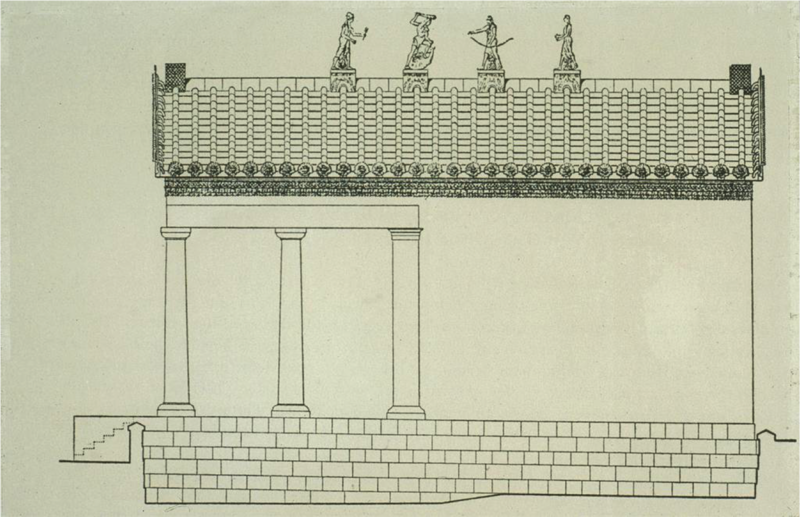 2 Another well-preserved figure that decorated the roof of the Temple of Veii exists today, although it is separate from this group of four figures that relate to the Golden Hind myth. This additional figure is of Latona (Leto), a goddess with the child Apollo.